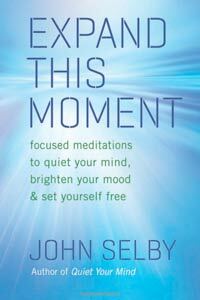 Considered by some to be one of the most valuable and practical meditation-related titles they’ve read, John Selby’s book, Expand This Moment, invites us to stop and take time to enjoy the “right now”. I’m of cattle ranching origins in California and Arizona, one of the few remaining people who actually did the work of a cowboy while growing up–not so glamorous actually. I was eager to head back east to Princeton–and from then on it was non-stop change … government-funded psychedelic research in the late sixties … meditation exploration and working as a therapist in the seventies … loads of trips south into Indian realms where I felt most at home. Then Europe in the eighties where I found people seriously eager to plunge into the deeper mind-management methods I’d been developing. During the last decade I’ve been finalizing my life work in developing ‘short-form meditation’ techniques and Focus Phrase methods for quickly quieting the mind and shifting into present-moment full engagement. Quite a number of books have emerged along the way. Selby’s conversational writing style and humor is appreciated by readers. The meditations are quick and realistic. Reviewers across the board highly recommend this book. Wow, the spiritual book Expand This Moment, by John Selby is wonderful. It has a calming energy about it that you might just be able to feel simply by holding the book! Its contents pulled me in. Selby carves a path to inner calm and offers essential reminders to bring us into the present moment. In the book, John Selby’s accounts about his own life challenges and times of emotional breakdown are refreshingly honest. He speaks and writes from experience and I know we all can relate to his words. For example, he speaks of a night where he collapsed into a heap… because of an unsuccessful business… He felt like a failure that night. We have all been there at one time or another. But for John, that night was a turning point. Instead of being stuck in the darkness, his heart, body and awareness brought him into the light… He had a powerful awakening and a realization of his Divinity. This was a similar experience to the awakening Eckhart Tolle had, if you are familiar with The Power of Now. John’s book is filled with practical and easy to understand tips, such as “Focus Phrases” we can use to calm our mind. These are phrases that lead us into a powerful experience of wholeness and serenity. John takes our hand and gently teaches us how to use his tools. He addresses our doubts and fears and gives us guidance back to our inner power. Selby teaches with a gentle and quiet knowing, not a “high and mighty guru status.” He is in his 60′s, a real person, a good communicator with a warm heart. I love Expand This Moment because it is presented in short, easy-to-explore pieces. It is the perfect blend of simple truths, powerful meditation practices, and real life stories. You can see the full review at Lightworkers World here. Have you read Expand This Moment? Leave your impressions below. The post Read This: Expand This Moment appeared first on About Meditation.